On Monday’s Mark Levin Show, Today we celebrate Martin Luther King Jr. Day, which is a National Holiday and the federal Government is shut down, as it always is on a National Holiday. 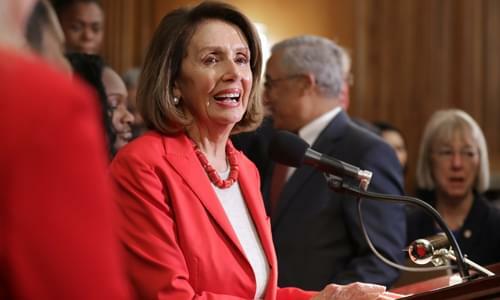 Nancy Pelosi effectively controls the appropriation process in the house and whether or not the federal government will receive $5.7 Billion for the border wall, but Pelosi just keeps blocking and obstructing the government from re-opening. Yes, the president can use the National Emergencies Act, but this is a rare exception, the reality is that Congress must deliver on appropriations. Therefore, the ball is in Pelosi’s court! Then, in response to this program’s calls for a leak investigation regarding Friday’s BuzzFeed News story—which was challenged by the Special Counsel’s statement saying the article was inaccurate— BuzzFeed News reporter Anthony Cormier said he couldn’t elaborate because it might prompt a leak investigation. It seems BuzzFeed, Robert Mueller, and The White House heard this program’s bombshell analysis in their fake-news story, loud and clear. Afterwards, freedom of the press isn’t owned by the media, its owned by We The People. When people sit in these powerful positions and lie, and spin, they in fact become the enemy of We The People. Over the weekend the fake news media claimed a bunch of catholic high school kids were berating a native American activist, however, a closer look at the full video shows the boys were walking away from another group that was harassing them, not the other way around. Later, President Trump made several concessions in an imperfect proposal, but it does not include amnesty. Trump is fighting harder than any other president in history for physical barriers at our southern border. But, what exactly is Pelosi proposing in these negotiations?